Growing up, we had plenty of corned beef and cabbage. It was one of Mom’s favorites; she made it once a month or so in a big iron Dutch oven. These days we only get homemade corned beef and cabbage when we make it ourself. Unlike Mom, we can’t hang around the kitchen and watch the pot. Fortunately, McCormick sent us this slow cooker recipe. We toss the ingredients into the cooker, turn it on and come back in eight hours. Slow cooking lacks the glamour of aroma wafting from the big iron pot, but it does the job. Corning refers to curing or pickling the meat in a seasoned brine. The word refers to the “corns” or grains of rock salt (today, kosher salt) that is mixed with water to make the brine. 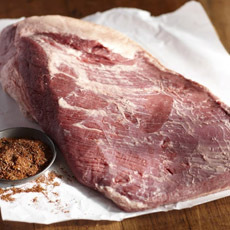 Typically, brisket is used to make corned beef; the dish has many regional variations and seasonings. Smoking a corned beef, and adding extra spices, produces pastrami. Cattle in Ireland were not used for meat but for dairy products. Pork, an inexpensive meat in Ireland, was a dinner table staple. But in the U.S., pork was much more expensive than the American staple meat, beef; and brisket, which required several hours of cooking to tenderize, was an affordable cut. 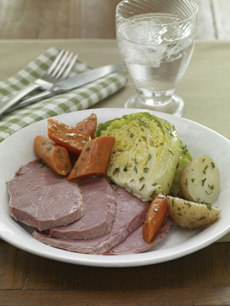 Irish-Americans substituted corned beef for the bacon, and and Corned Beef & Cabbage was born. Trivia: The first St. Patrick’s Day parade originated in New York City, in 1762. Top: Slow cooker Corned Beef & Cabbage from McCormick. Bottom: Uncooked brisket from Double R Ranch, available from Williams-Sonoma. 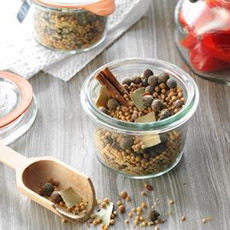 Top: If you don’t have pickling spice, you can make your own from spices you do have (photo Taste Of Home). Bottom: Toss everything into the slow cooker and come back at dinner time (photo Rival). Conventional Corned Beef & Cabbage simmers for about three hours on the stove top. Here’s a classic recipe with a twist: a touch of Guinness. But toss the ingredients into a slow cooker and come back in eight hours to dish out perfectly cooked corned beef and cabbage. Prep time is 10 minutes, cook time is 8 hours. 1. PLACE the potatoes, carrots and onion in a 6-quart slow cooker; place the brisket on top of the vegetables. Sprinkle with pickling spice and minced garlic. Add enough water (about 8 cups) to just cover the meat. Add the lid. For best results, do not remove the cover during cooking, except to add the cabbage in Step 2. 2. COOK for 7 hours on HIGH, then add the cabbage and cook for 1 to 2 hours on HIGH or until cabbage is tender but still crisp (not soggy). 3. REMOVE the corned beef to a serving platter and slice thinly across the grain. Serve with the vegetables. 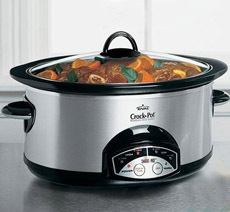 The original slow cooker was the Crock Pot, introduced in 1971 by the Rival Company. It was developed as an electric bean cooker, and was originally called the Beanery. Earlier, the Rival Company had introduced the electric can opener. Thanks, Rival! 1. COMBINE all ingredients. Store in an airtight jar in a cool dark place (i.e., not next to the stove or oven).